Probably the most famous of all dinosaurs, Tyrannosaurus Rex! At more than 40 feet long, it was huge and had the most powerful head of any dinosaur. It also had the biggest teeth of any dinosaur - about 60 teeth that were not only sharp and serrated, but also thick and strong, capable of crushing bones. Tyrannosaurus Rex could not chew, so had to swallow its food whole. Although the tiny two-fingered arms of Tyrannosaurs seemed very small, they were believed to have been at least three times as strong as human arms. They were too short to reach its mouth, but were probably used as meat-hooks. T-Rex had large feet to help it run quickly through the swampy environment in which it lived. Some scientists believe it may have run as fast as 35 mph, which was fast enough to catch its slower moving prey. There is also clear evidence that tyrannosaurs fought one another - most of the scars and wounds found on fossil bones of these great creatures seem to come from others of its kind. Evidence of large tracts housing olfactory, auditory, and optic nerves shows that the T. Rex had a strong sense of smell, good hearing, and enhanced vision. 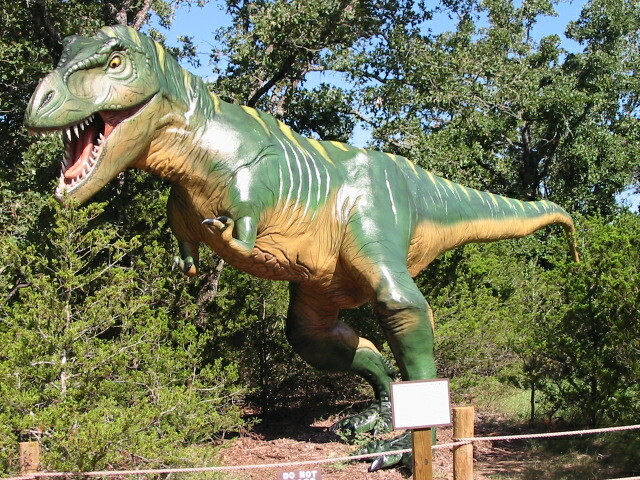 T-Rex is very well known, with more than 30 individual specimens having been found. The most famous of the fossils of this creature is "Sue" which is now on display at the Field Museum in Chicago. Sue is about 42 feet long; her largest tooth is almost 12 inches.